Summer has ended and so have the opportunities to wear our little cotton dresses...I'm saying this with a smile in my face. I really don't care much for summer weather and it's clearly because I grew up in a country where summer is all year long. This may sound like a dream for some of you, but it wasn't for me. Having too much of the same weather...believe me, it gets old. It really does! And mainly for someone like me (emotional dresser), that enjoys fashion and wants to experiment with different styles. Growing up, I remember watching European movies and seeing all these actresses and actors wearing fabulous cold-weather attire. I wanted to wear tall boots, coats and beautiful scarves, but with a 90-degree average weather, I knew that was going to be just in my daydreams. I love cold-weather fashion that is fun and well-made. This is why I'm very excited about sharing this blog post. A few weeks back I was introduced to a British luxury knitting company (since 1912) named G.H Hurt & Son. Before agreeing to collaborate with them, I did my homework, learning about their history, product, manufacturing procedures and overall transparency. Even though I worked for a giant manufacturing company for 17 years, I still love to learn from other types of manufacturing processes. I like to see where things comes from and how they are made; from a labor, engineering and raw materials stand point. I was able to find this type of information with G.H Hurt & Son's. It was very educating. To make the story short, I chose to style this gorgeous printed scarf and I had the confidence that it was going to have an outstanding quality. When the scarf arrived, I was floored not by only the craftsmanship, but by the stunning look, texture and feel of it - so soft to the touch. I immediately thought of so many outfits that could look terrific with this hexagon printed scarf. I know we're all about animal prints and stripes these days, so the idea of having a different print such as a geometric in my wardrobe actually felt refreshing. As you all know, I'm fond of basic pieces and one of the reasons why is because I can bring their game up by pairing them with a bold item. You can see what I'm talking about right here with this look. 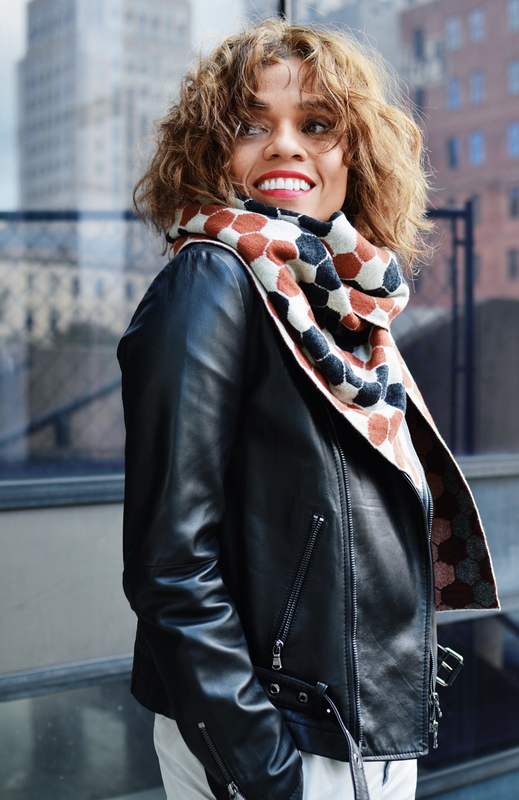 I wore some of my wardrobe's basics such as a pair of light khaki pants, white button-down and a biker jacket, but all were enhanced by a fabulous scarf. Obviously, there is color-coordination going on between my scarf, shoes and pants, which created an elegant harmony. My favorite part is how the hexagon print added a sporty, bold and yet sophisticated touch. You gotta love the striking contrast in-between the burnt orange, navy and grey. This striking unisex scarf will definitely make a great Christmas present for a loved one or for yourself! Scarf: G.H Hurt & Son/Jacket: Emporio Armani/Pants: Save Khaki United/Shirt: L.L. Bean/Shoes: Gianvito Rossi/Earrings: Robert Lee Morris/Tote: Everlane.